Los Angeles, CA (March 23, 2017) — ID10T Music Festival & Comic Conival will take over the Shoreline Amphitheatre and surrounding grounds in Mountain View, CA on Saturday, June 24th and Sunday, June 25th. Created and hosted by Chris Hardwick, one of the most recognizable faces in pop culture fandom and one of today's top touring standup comedians, ID10T (pronounced I-D-ten-T) will combine chart-topping musicians, renowned comedians, makers, and some of the most influential people in the entertainment industry, together in one place for a once-in-a-lifetime weekend experience. Today, ID10T has announced a slew of additions to its already impressive lineup. Musical guest Tank And The Bangas have been added to Saturday's Shoreline Amphitheatre Main Stage lineup, alongside Weezer, OK Go, Lord Huron, and more. With their fun and uniquely energetic sound, Tank And The Bangas were the winners of the 2017 NPR Music Tiny Desk Contest. Comedians Greg Proops, Brent Weinbach, Dan Mintz, Marcella Arguello, Jonah Ray, and Mike Phirman have been added to the Monster Energy Comedy Tent and the following comic book artists have been added: Donny Cates, Jai Nitz, Justin Greenwood, Matthew Southworth, Morgan Beem, Ngozi Ukazu, Brent Schoonover, and Phil Hester. The two-day groundbreaking event will feature all of the best components of a music festival, plus the addition of comedy, comic book fandom, and entertainment, all in an outdoor setting. Each day, pop culture enthusiasts will have the opportunity to roam exhibitor booths, meet comic book artists, and catch their favorite TV and movie casts on back-to-back panels and podcasts, including a special live taping of Hardwick's own Nerdist Podcast. In the evening, the grounds will transition into a music and comedy hall for live performances from some of today's top artists and comedians. Hardwick will be onsite to host the event, moderate the main panels, and introduce select bands and comedy performers. Produced by Live Nation and Synergy Global Entertainment (SGE), ID10T will feature three entertainment stages; an interactive festival area with games, rides, and fan experiences; a massive exhibitor village; and a curated artist alley where some of the biggest names in comic books and entertainment will meet fans, showcase their art, discuss their craft, sign autographs, and more. 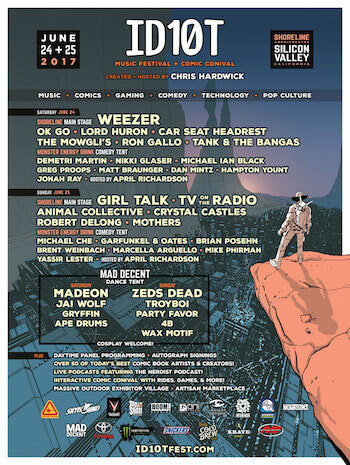 The Shoreline Amphitheatre Main Stage will feature a diverse musical lineup with performances by Weezer, Girl Talk, Lord Huron, Crystal Castles, TV On The Radio, OK Go, Animal Collective, Car Seat Headrest, The Mowgli's, Robert DeLong, Mothers, Ron Gallo, Tank And The Bangas, and more to be announced. The Mad Decent Dance/Cosplay Tent will feature some of today's premier DJs and electronic music acts with performances by Madeon, Zeds Dead, Jai Wolf, TroyBoi, Gryffin, Party Favor, Ape Drums, 4B, Wax Motif, and more to be announced. The tent will also host nightly Cosplay contests. The Monster Energy Comedy Tent will feature sets by some of today's most entertaining comedians in an intimate, club-like setting. Hosted by April Richardson, performers will include Demetri Martin, Michael Che, Nikki Glaser, Garfunkel and Oates, Michael Ian Black, Brian Posehn, Greg Proops, Brent Weinbach, Hampton Yount, Matt Braunger, Dan Mintz, Marcella Arguello, Jonah Ray, Mike Phirman, Yassir Lester, and more to be announced. A preliminary list of participating comic companies includes Skybound, Valiant, Oni, Boom! Studios, Top Shelf, AfterShock, Insight Editions, Aspen, and HowToons. Comic artists will include Cameron Stewart, Babs Tarr, Becky Cloonan, Andrew Robinson, Rick Remender, Matteo Scalera, Jason Shawn Alexander, Gerry Duggan, Phil Noto, Nick Dragotta, Donny Cates, Jai Nitz, Justin Greenwood, Matthew Southworth, Morgan Beem, Ngozi Ukazu, Brent Schoonover, Phil Hester, Ramon Villalobos and many more to be announced. Information on tickets, pricing, VIP packages, and more is available at www.ID10TFest.com. 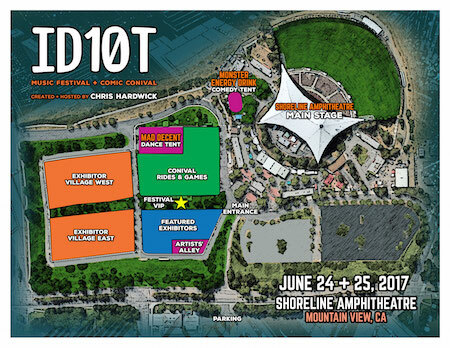 ID10T boasts a massive festival area directly adjacent to the amphitheatre's music stage. All tickets including festival general admission, reserved seating and VIP have free roaming access to the festival area, which includes the Mad Decent Dance/Cosplay Tent, Monster Energy Comedy Tent, and full exhibitor village. Festival General Admission Tickets start at $65.00, Amphitheatre Main Stage Reserved Seating Tickets start at $77.50, and Weekend Passes start at $99.00. ID10T is proud to partner with the following sponsors in its inaugural year: Monster Energy Drink, hosting the ID10T Comedy Stage, Toyota, the exclusive automotive partner, Snickers, Krave Jerky, Peet's Coffee and Tea, Musicians Institute, Lyft, and many more.